Caris leadership joined the East Region team for our Regional Leadership Development Institute in Knoxville, Tennessee. During the day long meetings, we discussed the nature of function versus purpose, what makes everyone at Caris leaders, and received valuable training on service recovery and quality reporting. At night, we celebrated all of our employees, but in particularly we celebrated our 11 World Class Award Winners. World Class Award winners are nominated by their peers. They are Caris employees who go above and beyond to provide hospice care with grace to our patients and their families. Please join me in thanking the following Caris employees for their role model behavior. Caris also continues to recognize the collective team efforts necessary to maintain high performance through the Caris Excellence Certification. The East Region had 7 offices receive an Excellence Certification this year, including the first ever Level 5 Certification. 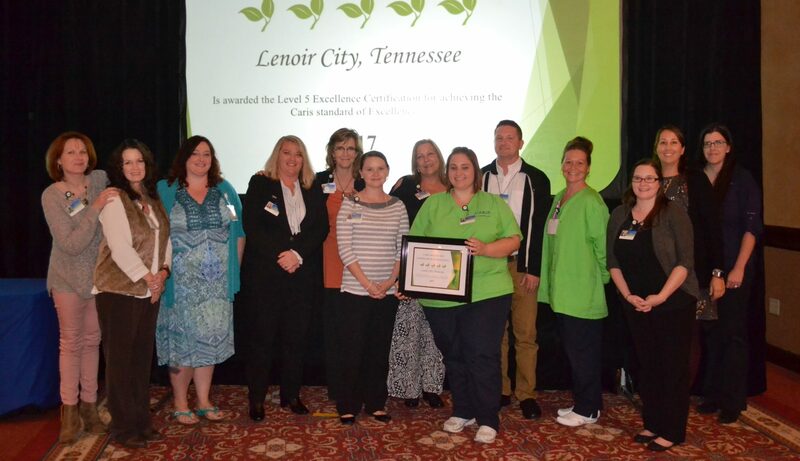 The Lenoir City office accepted its Level 5 Excellence Certification and was named the East Region Office of the Year at the Employee Appreciation and Awards Banquet.